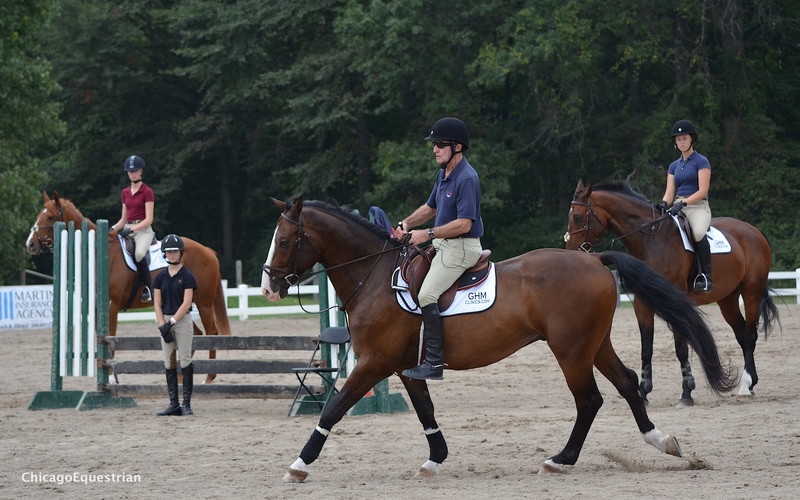 Temperance, MI – September 1, 2014 – The first day of the George H. Morris and USHJA Trainer Certification clinic at Hunters Run Stable in Temperance, MI, began after a competitive weekend which included the Michigan Hunter Jumper Association (MHJA) Medal Finals, which Morris judged. 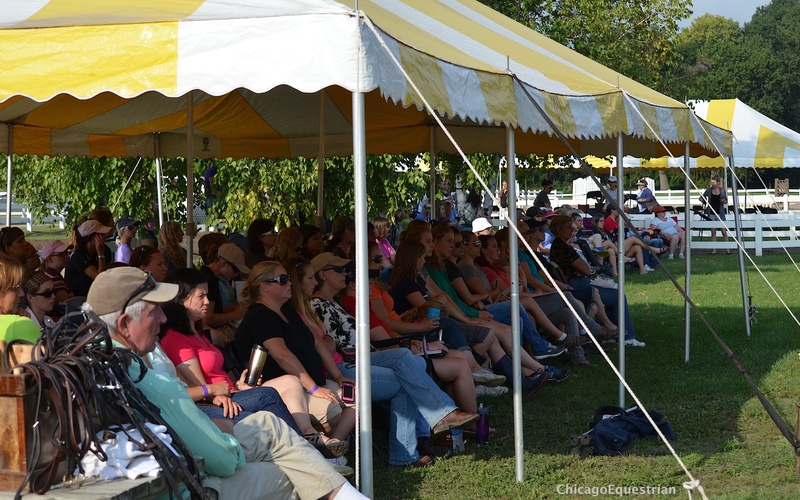 An impressive turnout filled two tents with spectators, who came to watch the legendary coach work with three groups of riders. 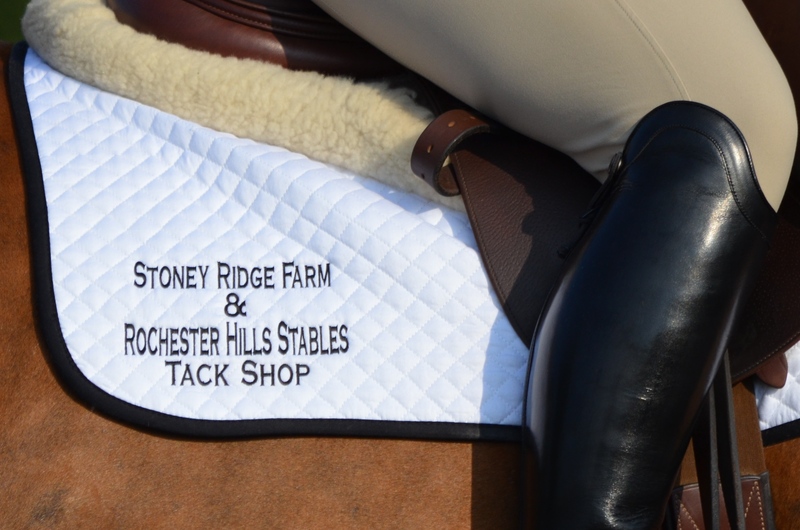 The clinic was organized by Scott Alder of Chelsea, MI, a USEF R judge, course designer, trainer and continuous supporter of the Michigan Hunter Jumper Association (MHJA). Huge effort was put in by Alder to organize dates and Morris’s schedule to not only get the clinic to happen, but to schedule Morris to judge the MHJA Medal Finals over the weekend as well. An impressive turnout at day one of the clinic and trainer certification. Along with Morris, Diane Carney of Antioch, IL, was the second of four judges on the panel for the medal finals. 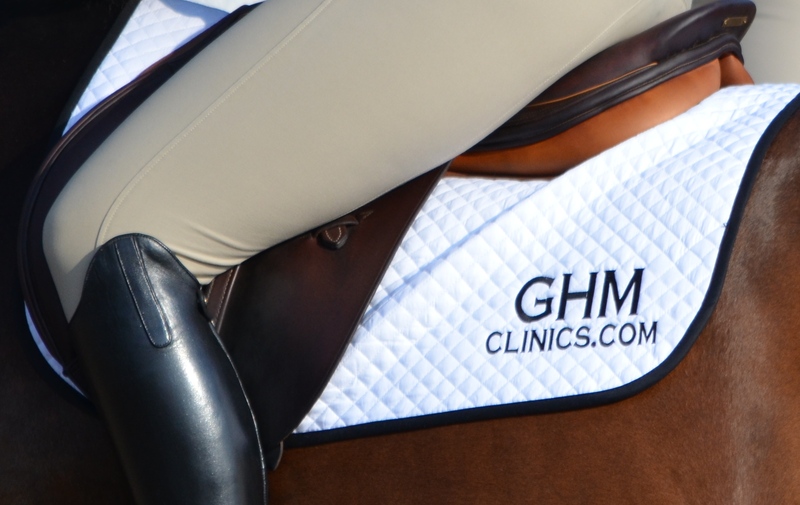 Carney stayed to help organize the riders and some of the final clinic details, since she has organized the George H. Morris clinic in Chicago successfully for over 25 years. Morris, the former U.S. Chef d’ Equipe, travels the world educating riders on the basics of horsemanship and the forward seat. His lengthy resume attests to his success as a rider, trainer and Chef d’ Equipe, earning multiple Olympic Medals. His clinics are methodical and organized, stressing proper turnout of both horse and rider, basic position and horsemanship. Morris adjusts the position of the stirrup. Morris began by talking about how safety should always come first, meaning safety of the horse and of the rider. 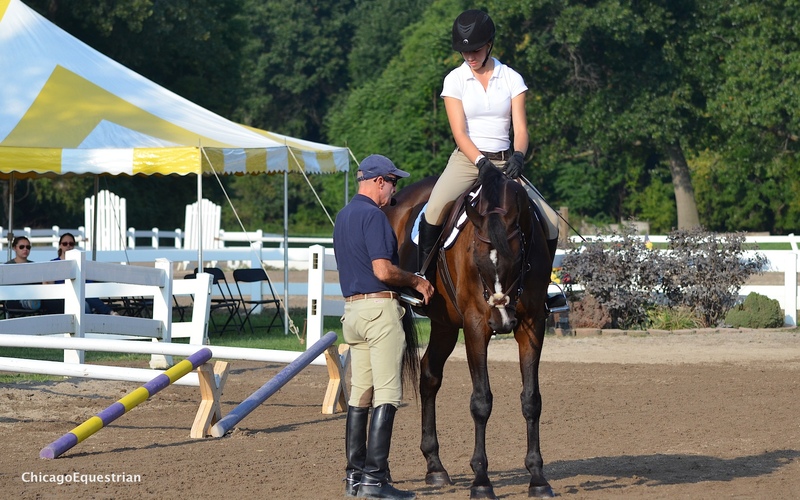 He then reviewed basic position and stirrup length. Morris explained to trainers in the certification program to teach with repetition and for students to copy a correct rider. Morris also teaches by demonstration, as he used one of the rider's horses and demonstrated straightness of the horse and emphasized the importance of a straight horse and use of the outside rein and inside leg. 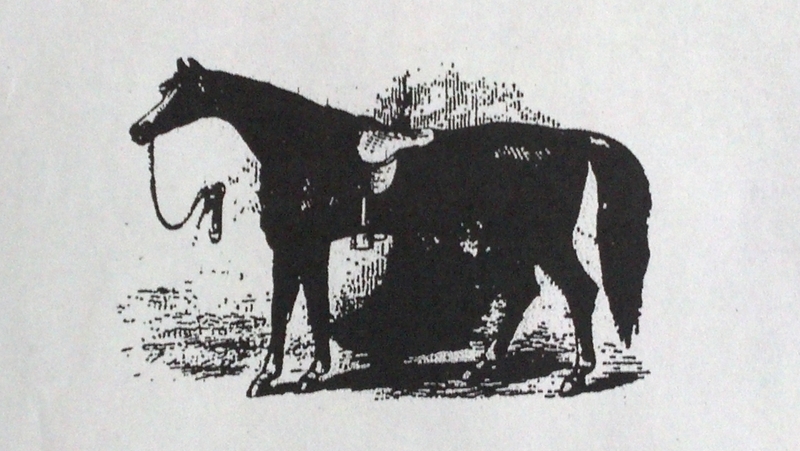 Morris demonstrates straightness of the horse. The theme carried through to the jumping and the exercises over fences worked on the same inside leg outside rein, diagonal aids. 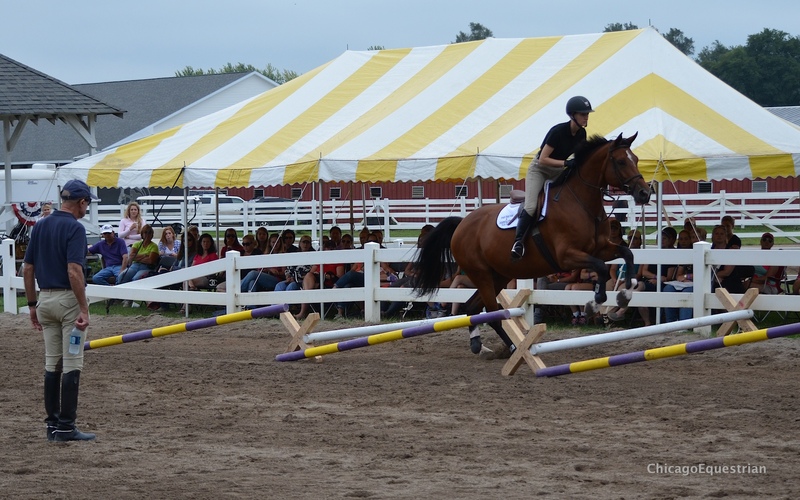 Morris demonstrated the half seat over fences and emphasized the light seat with two point and three point contact. Gymnastics emphasized the rider's position. During the three sessions, Morris would relate his teaching to what he saw as he judged the previous days. Groups worked on the figure eight, which was a test for one of the medal finals. Morris also addressed the teachers in the USHJA Trainer Certification program, giving them proper theories to teach and important fundamentals to emphasize to students. Morris shows correct position of the hands. Morris was pleased with the students and their eagerness to learn. The riders were nervous but excited for their chance to ride with the man who defined the sport and continues to emphasize the importance of the forward seat. Trainers were grateful to Alder for putting both the Medal Finals and the Clinic with USHJA Trainer Certification together and for adding inspiration to the area industry. Auditors are welcome for $75per day. Trainer Certification is an additional one-time fee of $50. For more information on the clinic contact Scott Alder at 734-395-9086.